Have you just got a new iPad Pro? Buying a case and/or cover for it is the next thing you need to do, whether for protection or adding some features. Here, we are going to share some of the best iPad Pro cases and covers for you. Each of them has a different purpose and excellent features. The main reason anyone would buy a thick case or cover for their iPad Pro is to protect it against an accidental drop or bumping into the wall. KHOMO iPad Pro 10.5 inch has perfectly balanced the style and protection factor in one convenient package. 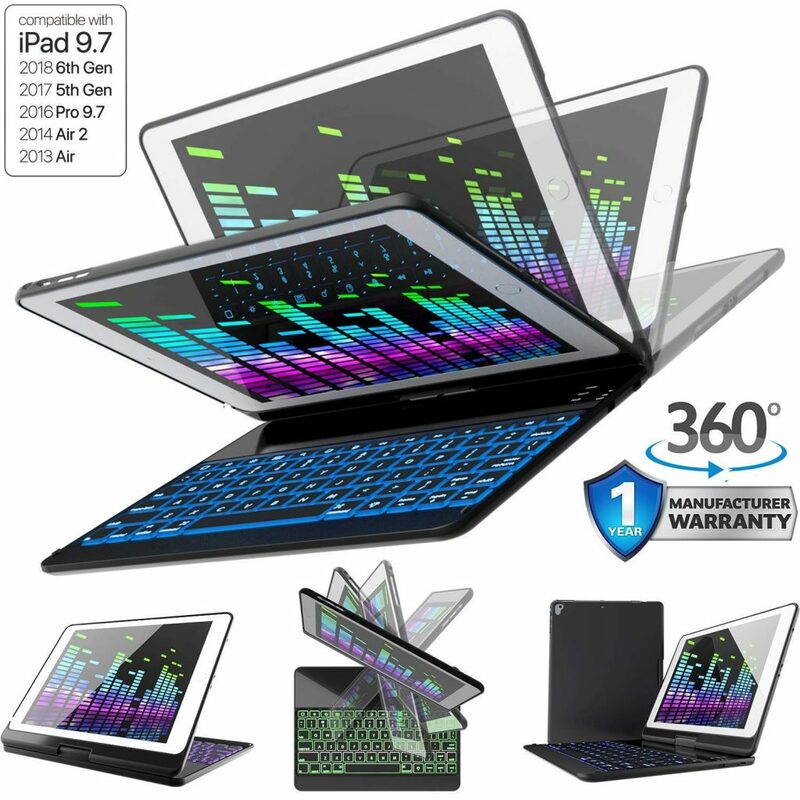 The idea is to provide a protective case for the tablet which is also compatible with the keyboard that you may have purchased separately. 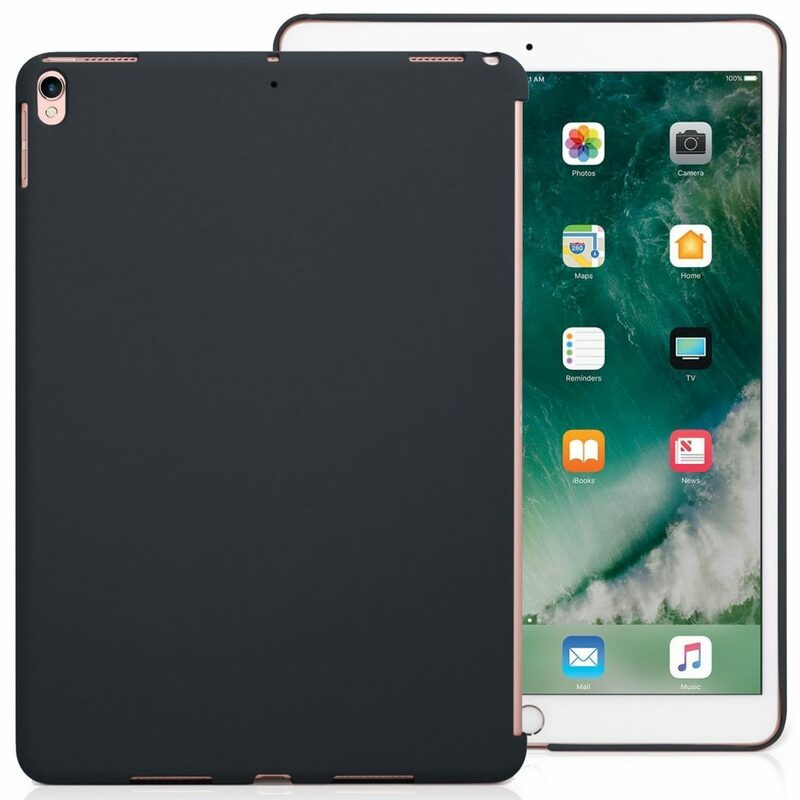 The case has been specifically designed for the 10.5-inch iPad Pro and is not compatible with other models. The cutouts allow users easy access to the volume rocker buttons, the power button and the charging port. The speaker cutouts ensure you can enjoy your videos and presentations without having to use Bluetooth headphones with them. The exterior layer is made of hard PC material while the interior area is made with flexible TPU material. It is slim and doesn’t add any bulk to your iPad. It allows you to use the tablet in one hand or use it to draw items on it without having to put up with the added weight of a thick case. KHOMO has done an excellent job with this case, including the extra large space to attach a keyboard, if required, without having to remove the protective cover. What makes the KHOMO iPad Pro case a great pick? If you haven’t already thought of any use for a magnetic stand, the makers of the Zugu case have ideas. They have developed a case that stands apart with its very subtle design, especially if you decide to buy the black colored variant. The stand is light and protective, yet they have managed to make it extremely thin providing an aesthetic look to your iPad. The manufacturers claim the leather-like cover is made using luxury materials similar to those found in the Mercedes Benz cars. 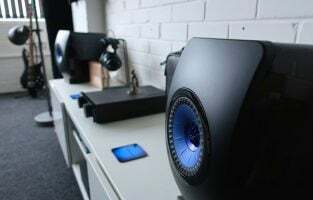 While it may or may not be true, the case is quite expensive than most other models and we have to agree that it might probably have such materials in it. It feels really good to the touch by providing great durability, grip and is even capable of withstanding a 5 feet drop because rubber is incorporated on the inside of this iPad cover. The Zugu case comes with a one year warranty and you can choose to get it replaced in case it starts showing signs of getting torn down or wear and tear. 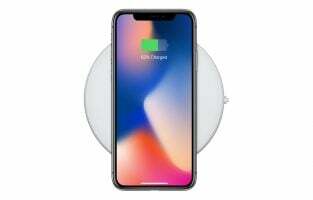 The cover is fully compatible with both the 2017 and 2019 models as Apple didn’t change the placement of the speakers, charging port or the button in these models but make sure you are purchasing it for your 10.5-inch model, not the bigger one. The cover is designed to meet the requirements of professionals such as chefs or artists who require to refer to the original image or a recipe while they are busy working. They can enjoy a hands-free experience with this product. What makes the Zugu case an amazing choice? 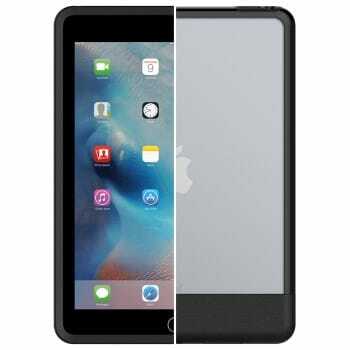 The majority of the manufacturers focus on making awesome cases for the 9.7-inch iPad and the iPad Pro 10.5 inch variant because they are hot sellers compared to the bigger model. The ProCase, however, has finally answered everything that you have been looking ever since Apple made the announcement of a large 12.9-inch tablet. The larger tablet is convenient for watching movies in a bigger screen, browsing the web, making spreadsheets or presentations, all on the go, without compromising the mobility factor provided by an iPad. It’s also more powerful with the Pro version. It is one of the hottest selling products online and literally has thousands of reviews that assure you that it is durable and stylish besides being very affordable. For buyers who have already invested a lot in the expensive iPad Pro, this is a must-have. The case is compatible with both the 2015 and 2017 models. The exterior are is made of high-quality leather which feels good to hold and improves durability. 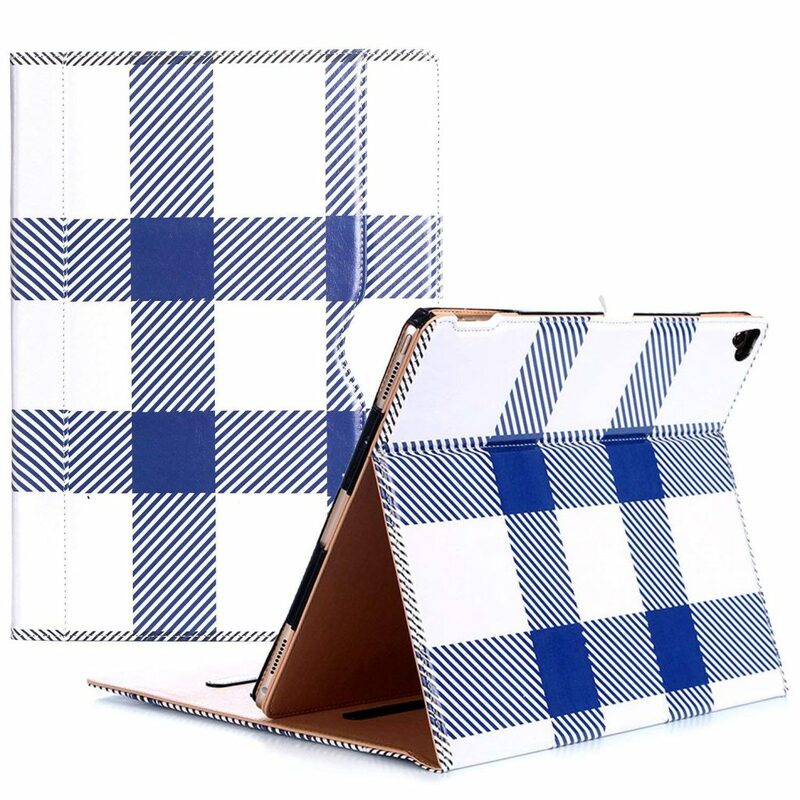 The interior area of the ProCase is made using a soft material to protect the tablet. As with all cases, this has been made with lots of cutouts on the sides to provide easy access to the speaker, charging port and the various buttons. The case also has a slot to easily store your Apple pencil and use it whenever required to take notes or draw on it. The standout feature is that the ProCase is available in a dozen different color choices including plain colors and abstract for every taste. What makes the ProCase an ideal choice? The brand Fintie has done an excellent job in making some of the best iPad Pro cases. Just because you are moving into the professional territory by investing in a tablet made for creation doesn’t mean you have to be serious. The Fintie products are available in a range of colors and there are some exciting designs available that add up to the originality. Apart from plain colors including royal blue, purple, rose gold and red, they also offer an all-black case with an angry smiley and the text don’t touch my iPad. 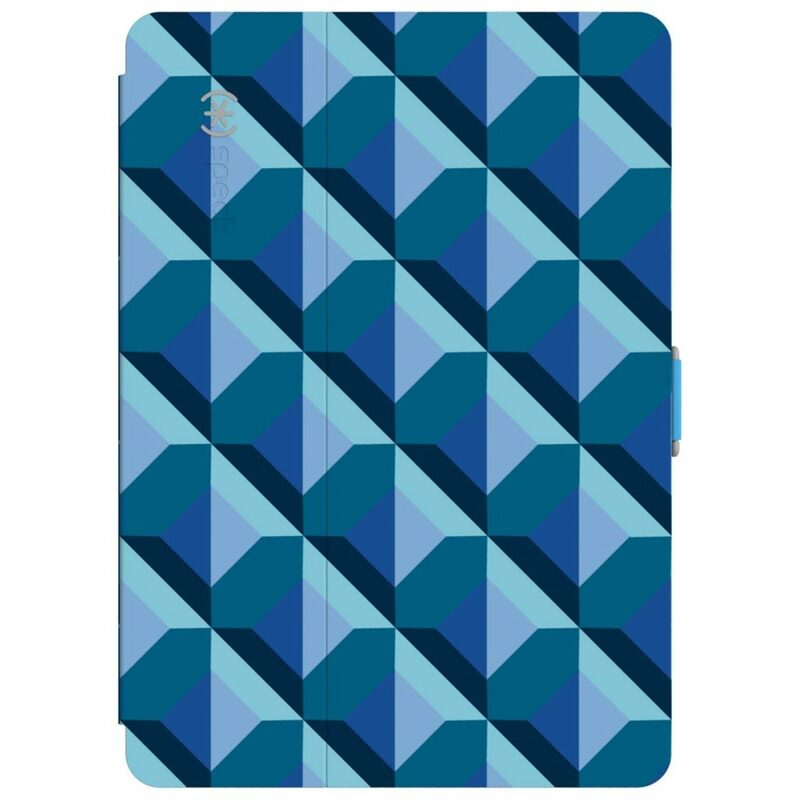 You might hardly come across such wacky cover or case choices for the iPad Pro 12.9 inch model. 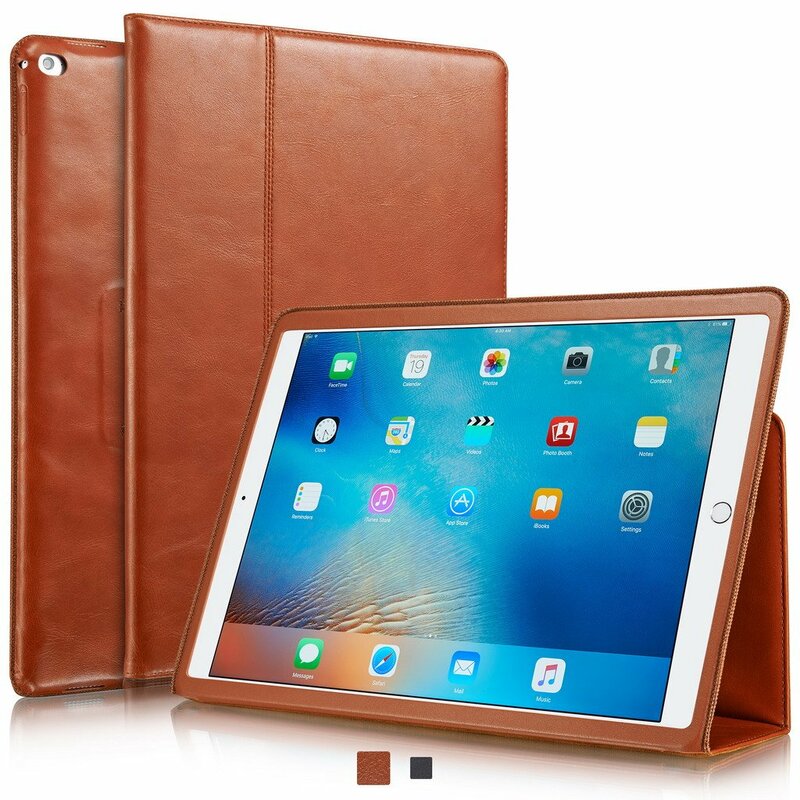 It is easily one of the best iPad Pro cases and covers available as the product has been showered with positive reviews, hundreds of them to assure you are making the right investment. The hinge can be rotated in 360 degrees to view content in different angles and it is highly protective with a dual-layer design. The synthetic leather is great for the environment and feels good to hold in your hands too. The elastic band holds the iPad and keeps the cover in place, protecting your large display when on the go. The unique designs inspired by popular wallpapers and scenery add up to the overall uniqueness of this case. What makes the Fintie iPad Pro 12.9 case the best? 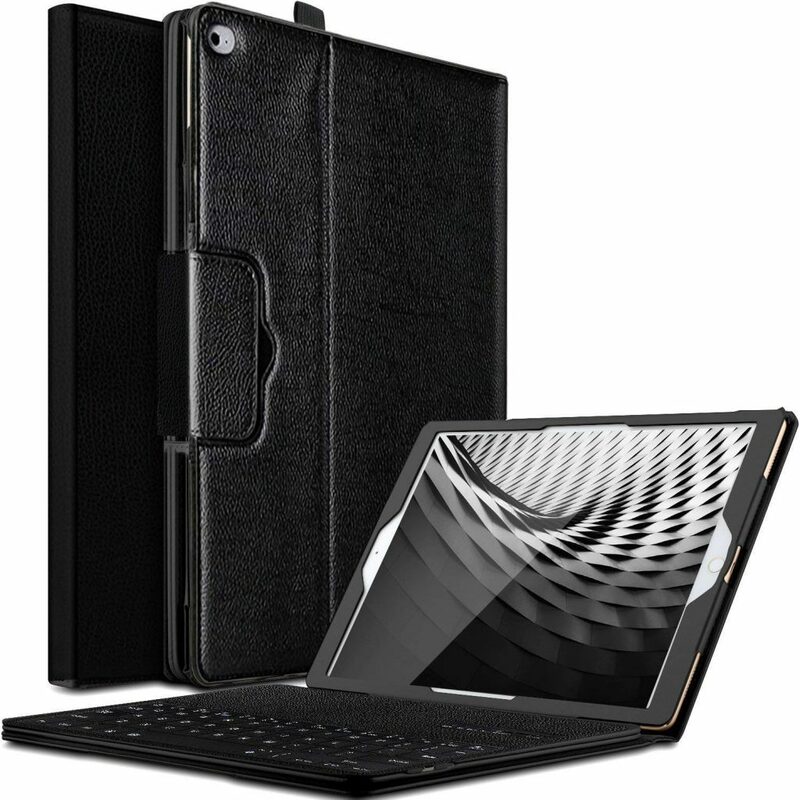 Considering the affordable price tag, it’s great value for money because you not only get a PU leather case to protect your iPad Pro 12.9-inch model but get a Bluetooth keyboard along with as well. Users who prefer the large tablet that is almost 13 inches would definitely want to get more productive with it. You just can’t do it using the touchscreen interface because a keyboard would make it much easier to edit stuff, type content and browse the web. The Pasonomi product delivers great build quality and the best part is that it comes bundled with a Bluetooth keyboard. The keyboard features tactile keys that provide a satisfying feel every time you click the buttons. They are optimized for normal typing and will not wear out easily when you use it regularly as you would do with any tablet. 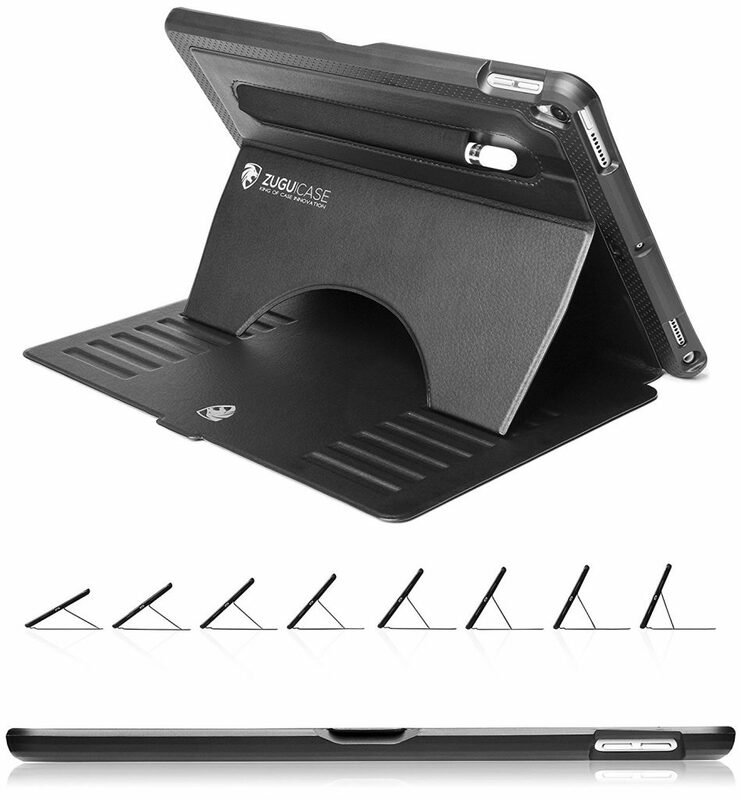 The case is versatile as it allows you to place your iPad in different positions and angles based on your requirement. The cutouts are perfectly done and soft so that you don’t feel the stress when you repeatedly press the power or the volume buttons. The tablet can be docked vertically for typing or watching movies. You can keep it flat to easily access the screen to create PowerPoint presentations and safely carry it around without damaging the edges with this extra protective case. What makes the Pasonomi case an ideal pick? 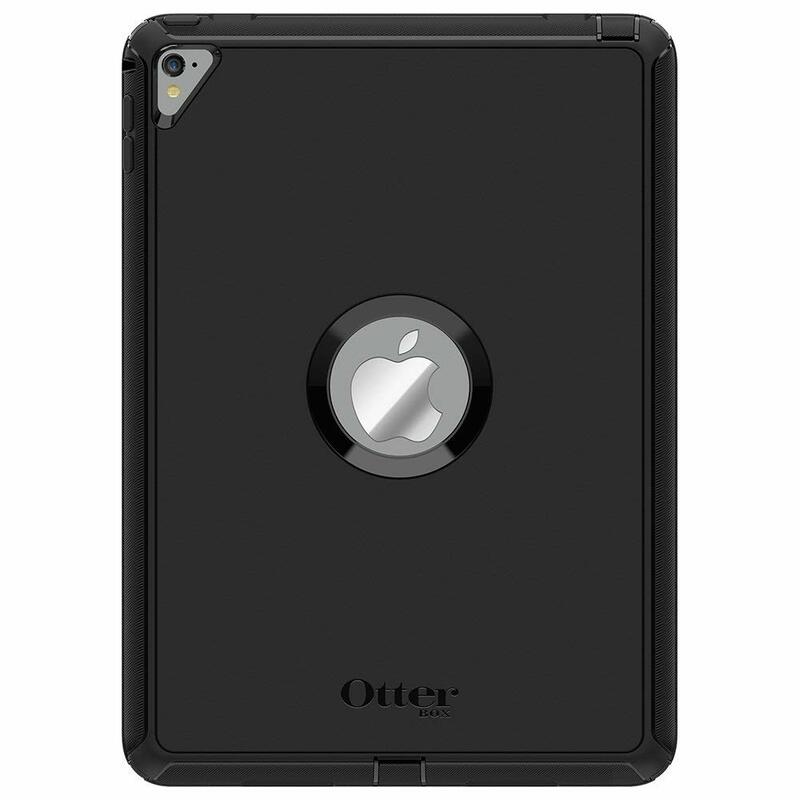 OtterBox is a popular brand that makes some of the best iPad Pro cases and covers. 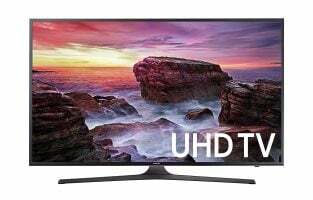 They have multiple series that focus on style, durability and usability. The Defender Series as the name suggests is easy to understand and focuses on providing the best protection for your iPad Pro model. The entire outer layer of the product is made using rubber-like plastic that significantly improves your grip on the tablet. The manufacturer further confirmed that they have used a triple layer design to protect the iPad. It is made using an inner shell and outer shell that are capable of absorbing the shock caused by accidental bumps. It has a touchscreen protector as well. Instead of using cutouts for all the ports like charging and speakers, the case uses covers which you can use during daily usage. Keeping them open often leads to accumulation of dust which diminishes the longevity of the product. It includes a shield stand that lets you watch movies, browse the web and draw on your iPad Pro 9.7 inch without having to hold it in your hand for long hours. There is a cover even for the home button on your iPad which provides the highest level of protection and the kickstand is quite durable. It also includes a dedicated space for your Apple Pencil in case you own one or plan to buy it. What makes the OtterBox Defender Series the most durable case? 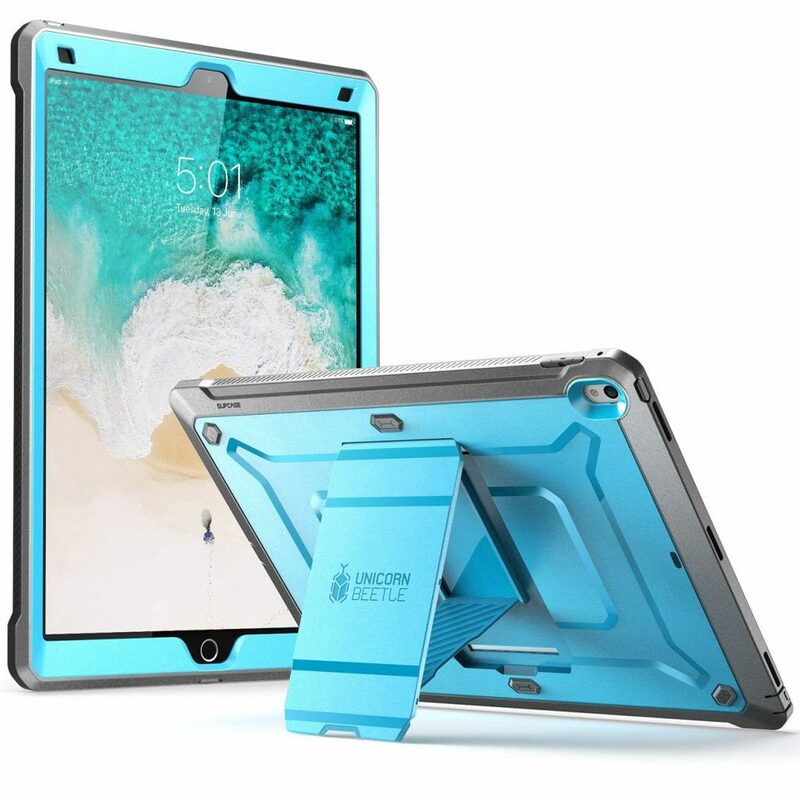 A quick glance at the SupCase iPad Pro 12.9 inch will let you know that it has been toughened up from scratch and should protect your tablet like no other case. The manufacturer is quite confident about their product because it has actually acquired military grade shockproof certification. It has been tested multiple times in a drop test and every time it defended the iPad’s internals as well as the display. The front area of the case is slightly elevated with bevel edges which protect the touchscreen display. 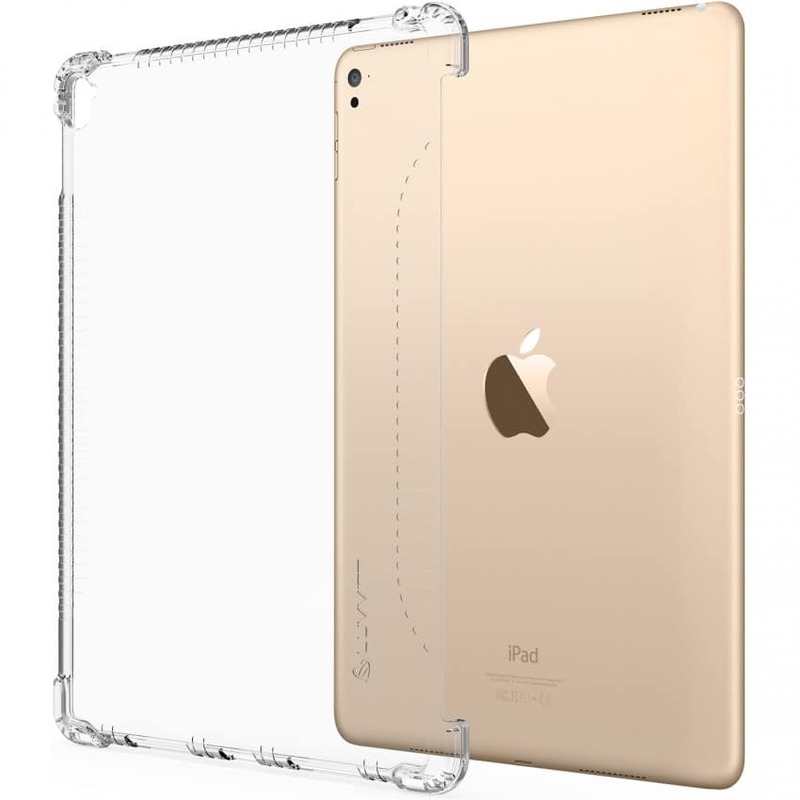 The case is made for the 2017 iPad Pro and should also fit the 2015 model but it is not meant to meet the changes proposed in the 2019 iPad model. The ports, including the headphone jack, are tightly covered to protect it against dust and water splashes. You can open it to access the 3.5 mm audio jack. There is a dedicated cutout for the charging port and the power button is accessible with a rubberized grip on top. The back plate is shielded and the edges are all textured allowing you to hold the iPad firmly with one hand without losing your grip. The kickstand on the back is firm and even allows you to draw using a pencil as it doesn’t slide off easily providing the firmness needed to get tasks done on your iPad Pro. What makes the Supcase an excellent cover for your iPad Pro 12.9? 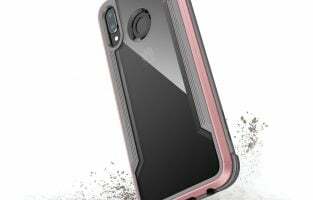 Speck Products had created a no-frills case which doesn’t promote its designs or the protection it provides too much, yet it gets the job done. A lot of first-time buyers or iPad lovers would want to pick a quick case that works as it should. They may not look for additional thickness, military-grade protection but would want a stand to go with it. 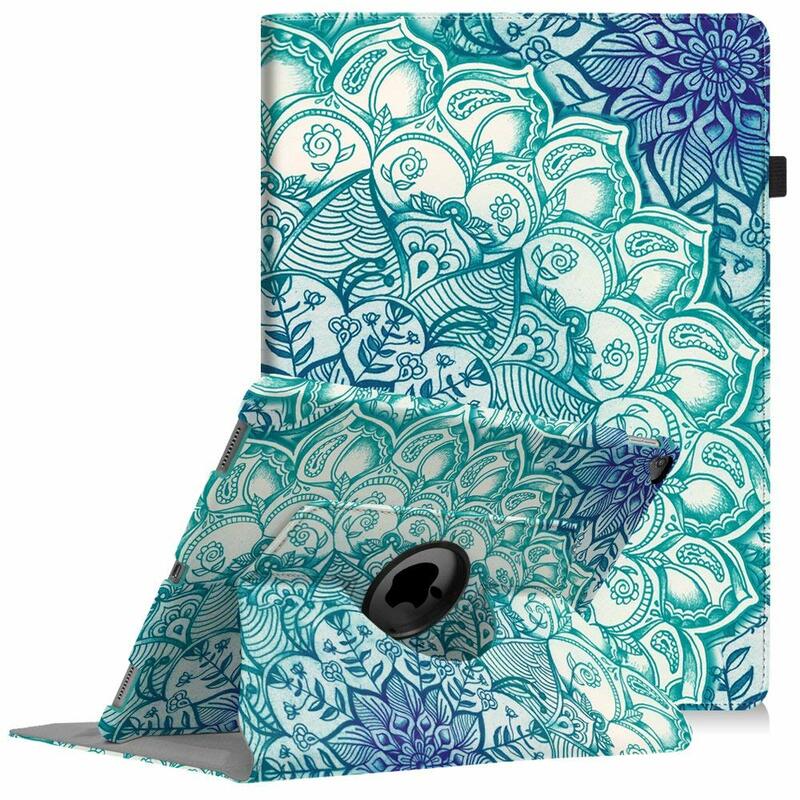 The StyleFolio Case comfortably ticks all the right check-boxes by being subtle, easy to use and is available in a range of colors as well as some abstract designs. The case has a unique feature which you might hardly find in most others. It has speaker scoops which improve the quality of audio on the loudspeakers and you don’t have to scoop them with your hands to get the best experience. At first look, the case might look like it covers the speakers but it is made to improve quality. The case has all the basic features like magnets to wake up/ sleep, has slots to access the 3.5 mm audio jack, charging port and easy access to the volume buttons. The iPad Pro 9.7 inch case is also compatible with other 9.7 inch models as well as the iPad Air. The Speck case has been rated to protect iPads against a 4 feet drop and is equipped with foam pads on the rear to protect the internal hardware. What makes the Speck StyleFolio Case the right case for your iPad Pro 9.7? The Lenrich case can easily be considered the most innovative idea of them all. 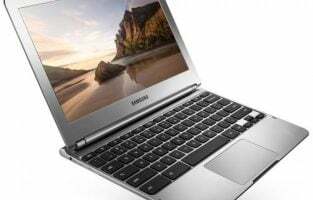 It dares to be different by mixing the best of both worlds by providing you with a touchscreen experience and a business laptop in one. The screen size of the iPad Pro 12.9 inch model is rather large and it can be really productive when you pair it with a Bluetooth keyboard. 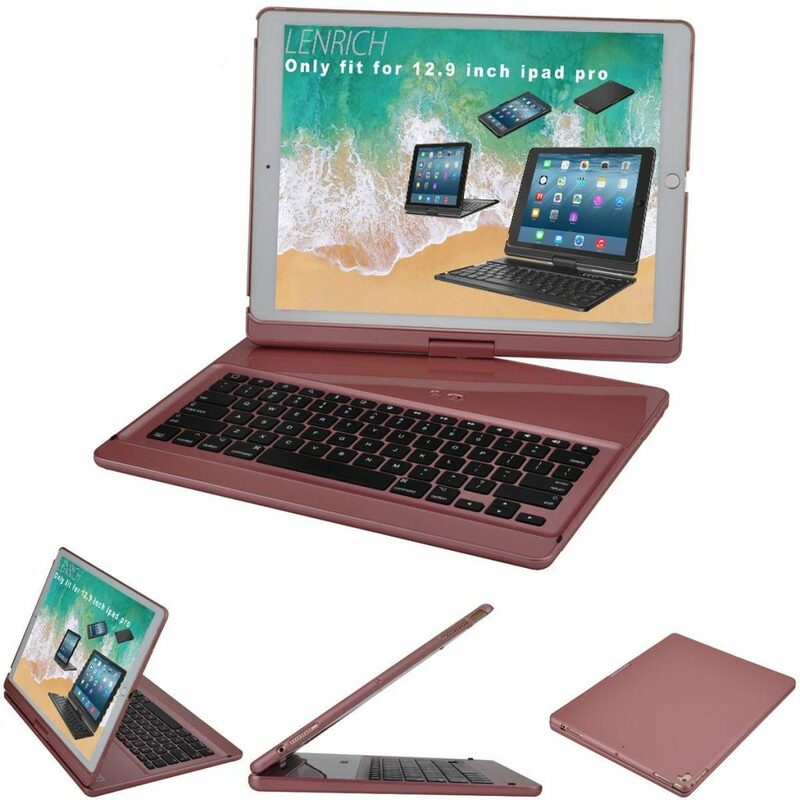 Carrying the keyboard around could pose a problem which is why the people at Lenrich have integrated the case and the keyboard into a single bundle. The product is available in three different models including black, rose gold and blue. An individual case is provided where you place the iPad and the rest is a sturdy keyboard with real MacBook styled keys. 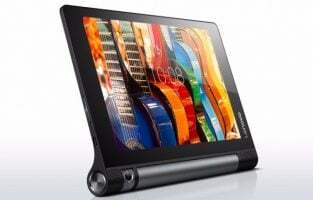 The case can be rotated into multiple angles and can be flipped over so that you can use your device in tablet mode. It is made using high-end ABS material and there are ideal cutouts to provide easy access to the charging port, speakers and the headphone jack. The case is compatible with iPad Pro models released in 2015, 2017 and has received many positive reviews. What makes the Lenrich case so unique? The term universal case comes from the design which has been made to fit multiple iPad models. While you can conveniently fit the iPad Pro models that has a 10.5-inch display or 9.7-inch display, it is also fully compatible with the iPad Air. It is the most productive case that you could ever buy because apart from carrying your tablet, there are individual pouches that help store documents and even your smartphone. It is a multi-purpose business portfolio where you can store your phone, driving license, credit cards and other paper documents. The case includes a notepad where you can quickly jot down points, in case you are not happy with your digital note-taking habits. After all, some people still love writing with a pen and paper which is what this case aims to deliver. The Khomo case is one of the best iPad Pro cases and covers because it focuses on productivity for business people who are often on the move. The convenient pouches make it easier to keep all documents and cards in one place so that you don’t have to search for your wallet. 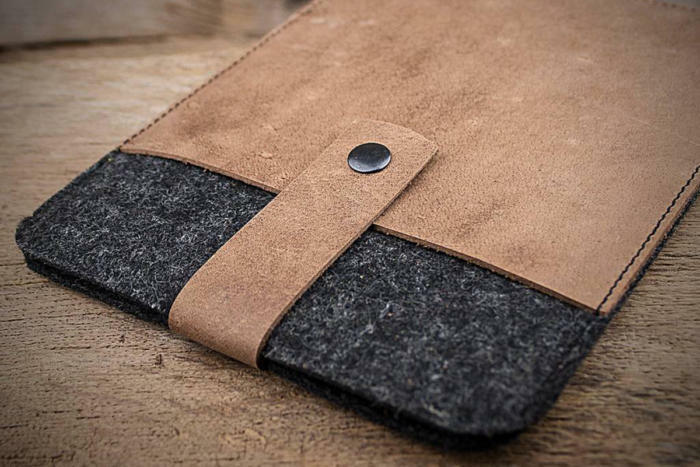 The outer layer of the case is made using leather material providing a comfy grip when using your iPad. What makes the Khomo case an amazing pick? Snugg has designed a simple yet productive case for the iPad Pro 12.9 inch model. The case is compatible with both 2015 and 2017 variants as Apple didn’t change any of the design elements including the position of the speaker, charging port and the power button. The case is bundled with a Bluetooth keyboard which users can easily swivel in any direction as they require. The iPad is attached to the top area of the case which is connected to the keyboard using a 360-degree hinge. You can easily use it in laptop mode where the display will be directly above the keyboard to easily type, browse the web and other functionalities. It can be flipped over into tablet mode where you can hide the keyboard and use it as a simple tablet for drawing, watching movies or playing games. The case completely covers your iPad Pro providing excellent protection on all sides and even the corners. It does have space for the ports and speakers but everything else is snuggly wrapped up in the lightweight, rubber-like material. The keyboard has full keys that offer a solid typing experience apart from dedicated buttons to connect via Bluetooth and switch it on or off. 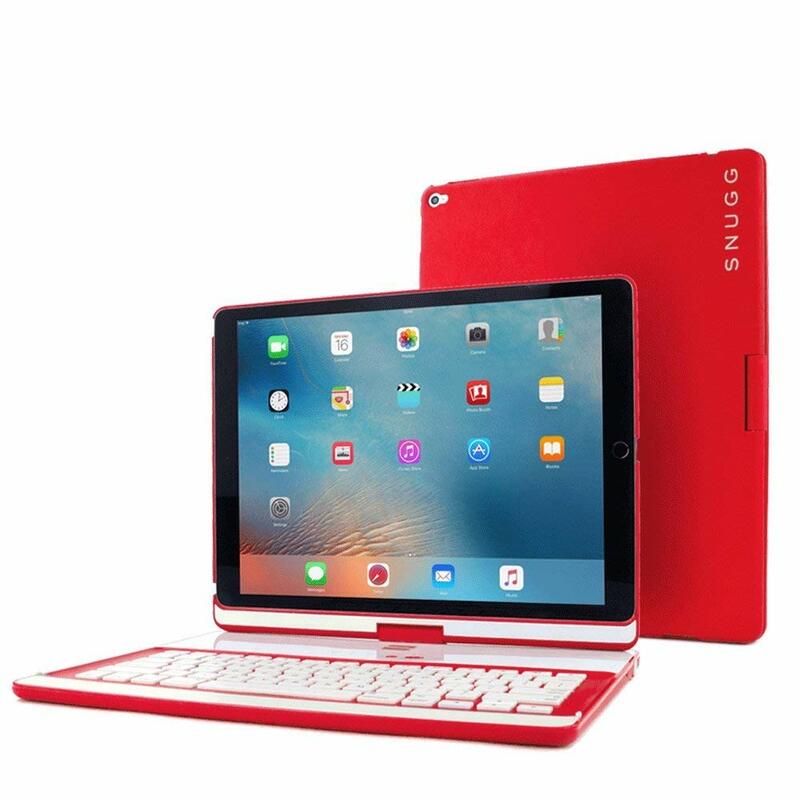 What makes the Snugg case a perfect protective case for your iPad? A majority of the best iPad cases and covers available in the market try to focus on being innovative in terms of usability. While some focus on offering the best durability others add a keyboard or provide a multipurpose case to store all your items. The Yekbee product is very different from most because it didn’t add a keyboard and left it there but rather made it a back-lit product allowing you to work in the dark. Most PC gamers are aware of back-lit mechanical keyboards they use on a daily basis for their gaming requirements. 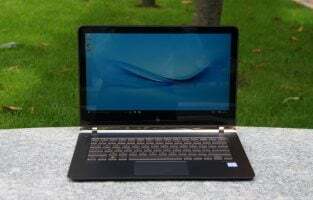 The advantages are many as you can type in the dark, send an email while watching a late night movie and no need to fumble to find the arrow keys or other control buttons on a Bluetooth keyboard. The Yekbee case allows you to rotate your iPad Pro 360 degrees to achieve the best angle based on your personal preference. It is available in different colored variants including royal blue, black, silver, gold, rose gold and jet black. It is made of polycarbonate material which feels great to touch and also has aluminum hinges that have long-lasting durability. The keyboard has tactile feedback making it fun for people who blog on the go, business professionals and anyone who would want a physical keyboard than the onscreen touchpad. The keyboard has a USB charge cable and is made using mechanical scissor keys which is something you will hardly find made exclusively for an iPad Pro tablet. What makes the Yekbee a productive case? What I like about the OtterBox Statement iPad Pro is its design and leather touch material. The case has a clear transparent back feature which is made of hard plastic. Therefore, it won’t cover the Apple logo on the back of iPad Pro. The genuine leather accents decorate all over the sides and about 10% bottom. It gives the case premium looks, though the back of it is made of plastic. Another thing I like from this case is the OtterBox logo which is placed in one of its sides and keep it in a simple design. The case is available in three color option: Lucent black, Lucent blue, and Lucent maroon. The OtterBox Statement not only has a simply beautiful design, but also can protect your iPad Pro from bumps, drops, and falls. It has an OtterBox Certified Drop+ Protection seal. Installing process isn’t difficult and it will perfectly fit on your iPad Pro. Unfortunately, it’s not available for iPad Pro 12.9-inch. If you are looking for a case that won’t cover the original beauty design of iPad Pro, crystal clear case is the answer. There are many transparent cases in the market, but my choice goes to Luvvitt Clear Grip. You can choose the one that compatible with Apple Smart Cover or not. I prefer the first one. Unfortunately, it’s only available for the 9.7-inch model. Luvvitt Clear Grip is made of the high-quality German Bayer thermoplastic. It’s not only super clear and flexible but also can protect your iPad Pro from scratches, drops, and bumps. It features air cushions in each corner to prevent accidental falls. Moreover, Luvvitt Clear Grip is designed ergonomically. It won’t slip when holding it. Interestingly, the price is affordable. It’s much lower than Apple iPad Pro Silicone Case. Whenever we see any product that is made of a genuine leather material, it always gives us a classy and premium impression. Kavaj is a German company which specially produces leather accessories. Their products are using the real cowhide leather for the outside, and the soft Flannel material inside won’t scratch the iPad Pro. Berlin model from Kavaj has a simply classic elegant design with high-quality genuine leather. It gives spaces for speakers, camera, headphone, microphone, and the lighting port. The case is also fit nicely for your iPad Pro. Actually, Kavaj offers three case models for iPad Pro: Berlin, Hamburg, and London. Each of them has two premium color option: Black, and cognac brown. However, I prefer the Berlin model because it’s the simplest one. Unfortunately, it doesn’t have a place for Apple Pencil. I think two angles positions are enough. One for typing, while the second one is for the entertaining mode. Actually, Hthe amburg model is quite similar to Berlin but has a little modification for providing five angles positions. London mode is designed for you who need some space on iPad Pro cases and covers to place business cards or paper notes. 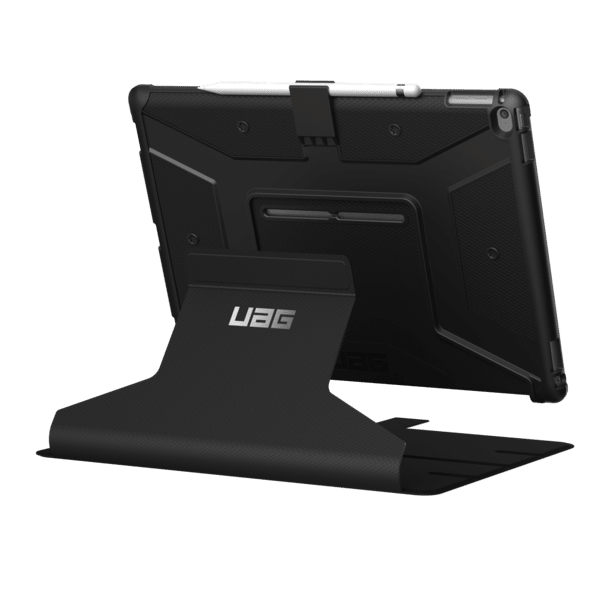 When we talk about the protection for iPad Pro, I would recommend UAG Metropolis. It’s made of a durable material that meets military drop-test standards (MIL STD 810G-516.6). The case is designed to be compatible with Apple Smart Cover. Actually, UAG Metropolis has two different mode designs. It has a unique removable cover that can be removed easily yet strong. You can change the cover with Apple Smart Cover and Keyboard. On its back, you can place the Apple Pencil perfectly. UAG Metropolis has a unique adjustable and detachable stand on its back. All you can do, just pull it out. This iPad Pro case is high recommended for those who have little kids. The best iPad Pro cases and covers are always based on personal preference and usage scenario. With so many third-party manufacturers, it is easy for you to find the one that best suits your need. 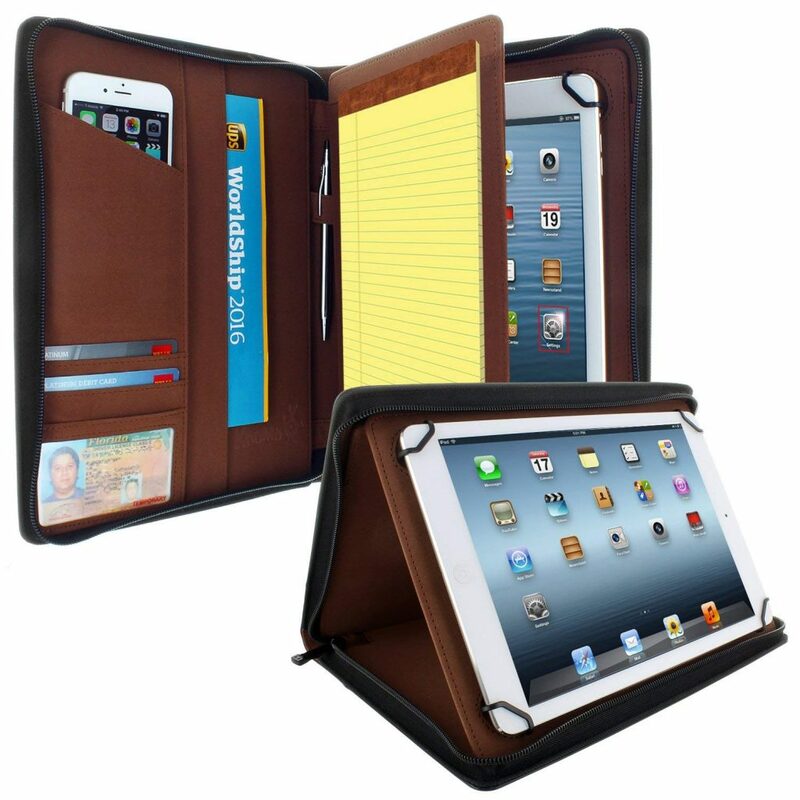 Be it a luxurious leather case or a business portfolio, you can find one at a moderate price. There are unique ones such as the case with a back-lit keyboard and if you prefer it, you can always pick one and enjoy the convenience it offers.